The client for the project was the Centre of Registers and Information Systems. Further information about the information system is available on their Web site here and here. Central Commercial Register is a collection of services related to various court-maintained registers of legal persons. The services include a central digitally signed ledger-based database containing the data of registers, the registrar software for the courts and various portals providing access to the registers' data or offering interested parties a comfortable way to submit digital applications to the courts. 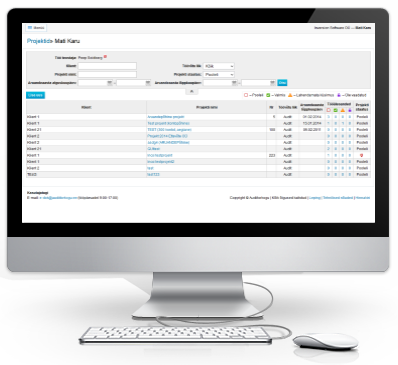 * Real-time monitoring of processing data and record amendments of companies. The portal is an environment which allows companies to submit documents to the Business Register electronically, without the need to use a notary’s services. The portal allows submitting applications for registering a new company, amending registry data, liquidating a company and deleting a company from the registry. The e-reporting environment of the Company Registration Portal - a solution established for electronic submitting of annual reports based on the XBRL standard; its use requires logging in with the ID card, the mobile ID or via online banking. The client for the project was the Centre of Registers and Information Systems. Further information on the information system is available on their Web site here. e-Financials is a simple web-based accounting software that assists companies to manage their book-keeping themselves. The software is located in the Company Registration Portal and both entrepreneurs and authorized persons (e.g. accountants) can use it. 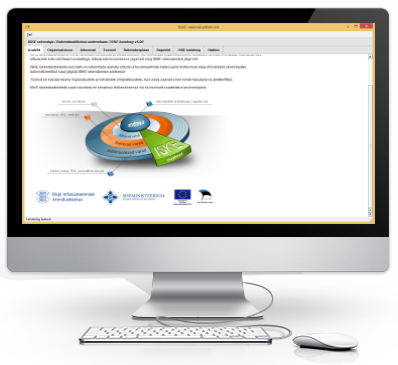 e-Financials is mainly intended for start-ups and SMEs but is also adapted and usable for NGOs and foundations. The software consists of five main parts: settlements, accounting, reporting, personnel and settings module. * Accounting – similarly to all known accounting software packages, the double recording principle applies here as well. In the accounting module, you can execute transfers, keep a logbook and a general ledger, check balances and calculate fixed assets. The client for the project was Centre of Registers and Information Systems. Further information about the information system is available on their Web site here (in estonian). The Official Announcements is an electronic journal that publishes all notices, invitations and announcements prescribed by the legislation. The website of the Official Announcements is freely accessible to everyone and new announcements are published there on every business day, as they are issued. Since 1 July 2003, the Official Announcements is published only electronically. The client for the project was Centre of Registers and Information Systems. Further information about the information system is available on their Web site here. e-Annual Reporting enables Estonian entrepreneurs to submit annual reports in XBRL format via the e-reporting environment of the e-Business Registry Company Registration Portal. This uniform e-reporting environment makes entering and submitting data much more convenient for companies, as there is a specific place, form and means of submitting all the required data. In addition to submitting their annual reports, companies can also use the new environment to prepare their annual reports in full. * Upload digital annual reports automatically generated by various accounting software in an international business standard format (XBRL). The client for the project was the Information System Authority. The CBDS (cross-border digital signature) Framework is a web services framework that enables users to create digitally signed documents (PDFs and BDOC containers) using a variety of national smart (ID-)cards. The trust status of CAs/countries is established through multiple TSLs (Trust Service Lists) managed through a web-based administration interface. The client for the project was the Estonian Board of Auditors. The e-dok software is designed for documenting the audit projects of sworn auditors and supports and assists sworn auditors in the performance of their duties and proper documentation. The client for the project is the Information Technology Centre of the Ministry of the Environment . * the government to manage all information related to the permits, including processing applications, issuing permits, generatings statistics etc. The client for the project was the Estonian Motor Vehicle Registration Centre. The system was phased out in 2014-2015. In November 2007, the Estonian Motor Vehicle Registration Centre launched a project called "Paberivaba ARK" (Road Administration e-service) which allowed individuals, vehicle importers, driving schools etc to perform activites relating to driving licences and vehicles on the Internet. The goal of the project was to make customer services more accessible, faster and more convenient for the customers in the form of e-services. For the customers the implementation of the project involves meant that applications could be filed around the clock with Estonian Motor Vehicle Registration Centre. The project also greatly facilitated the operations of the companies engaged in the sale of new vehicles with the Estonian Motor Vehicle Registration Centre. 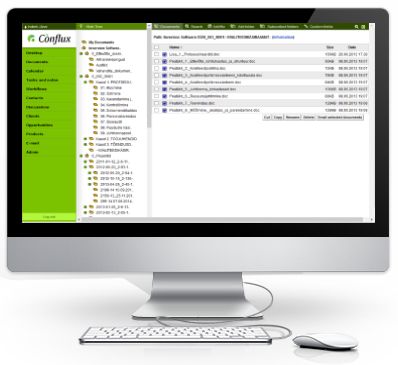 Conflux groupware server is your virtual office on the Internet. 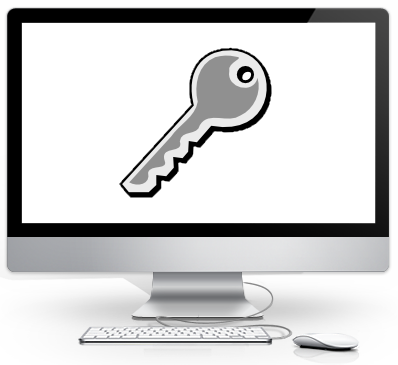 All your files, calendars, contacts and other business information is available any time, any place in a secure and standard-compliant form. Shared information will empower your workers with the collective knowledge base of the entire company, making them work faster, more efficiently and with better results. Conflux is used by customers all across the globe, including from Canada, USA, Japan, Australia, European Union countries etc. Further information about the information system is available here. The client for the project was the Information System Authority. Further information on the information system is available on their Web site here. ISKE utility tool is a software solution which helps and supports the implementation of the information security standard ISKE and allows to map the information assets used in an organisation and helps to keep an overview of the implementation of ISKE in the organization. The tool was programmed in Python and uses the PostgreSQL and SQLite databases. Multiple desktop platforms are supported, including Microsoft Windows, Linux and OS X.